What is happening at Laveen may surprise some. 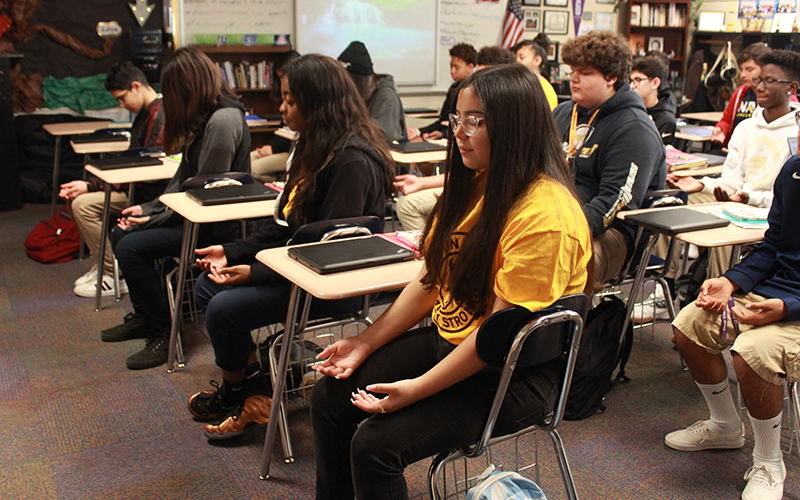 Not only is there an early morning yoga class for all students, but a midday one that complements detention. The space is known as the Mind, Body and Spirit Room. Early results have been encouraging. The school shows a 70% decrease in office referrals, Laveen principal Robert Caplinger said. This is the second full year that Tucker and his wife, Jackie, have led the school’s Mind, Body and Spirit Program, which was started with Tucker’s after-school program Live Pure Kids, which encouraged students to make healthier choices. Jackie Tucker had just finished her yoga certification at the South West Institute of Healing Arts and was asked by her husband to come to Laveen Elementary and do exercises with the students. The idea came from Gavin Tucker’s personal experiences growing up. The Tuckers hope to expand their program not only districtwide, but nationwide. CORRECTION: A previous version of this story misstated information about the program and its measured success because of incorrect information provided to Cronkite News. The story has been corrected, but clients who used earlier versions are asked to run the correction that can be found here.